A little over a month ago I bid adieu to the house that was my childhood home. With my sister, Robin, we made one more trip northward from the Philly area to remove any remaining items before we close (hopefully, soon!). After completing our appointed tasks, we expressed our heartfelt goodbyes to our neighbors of 30+ years. And then we made one more sojourn through the halls and rooms of the house that was once a home. Now vacant, we visited the each room and floor one more time, taking in the significance of this life transition. History. We humans are blessed (or cursed) with the ability to recall history. My childhood home is replete with this history. So much sorrow and pain. But yet there were moments of joy and happiness. Cats, though, are not burdened by memory. They exist in the moment. There is no significance to time—other than they’re either happy to see you or upset you’ve been away for however long—A day? A week? A month? But after a little softening, they cuddle and purr as if you were never gone. It is the present—not the past—that matters most. With the sale imminent, we’ve come to an end of an era. I’m not going to miss this house; not really. The only reason why I returned to Union for so long and so often was because of my parents. And they’ve been aging quite dramatically in the year that has passed… I just realize that, for better or for worse, my experiences in that house helped forge the person I am today. Maybe I should be jealous. She’s cute, small yet has quite the big personality. She’s looking svelte after a plump phase…and my husband dotes on her whenever she appears. Which, to Roger’s chagrin, is not as often as it used to be. She’s his furry girlfriend—the other woman. And there is a lot of history tied into that small bundle of energy known as Sluggo, Slugg Mamma or just…The Slugg. 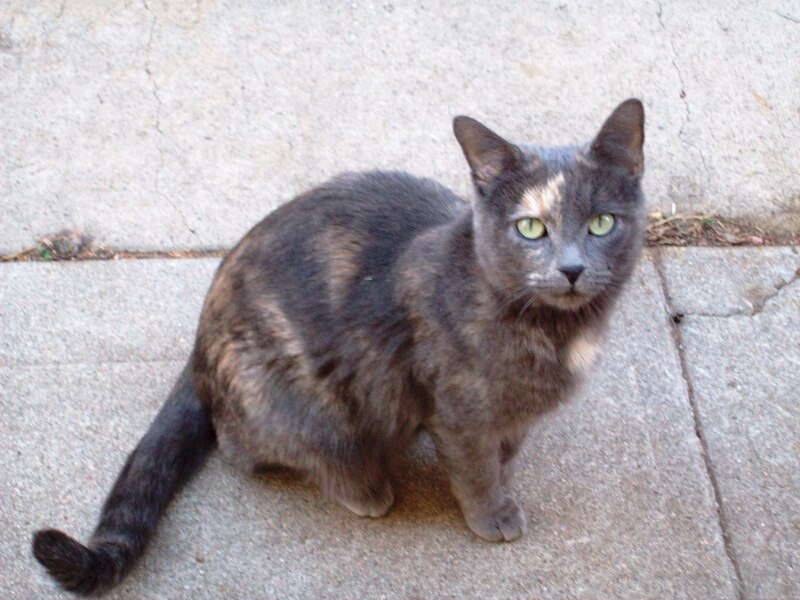 If you were to look for a definition of a feral cat, you would have seen her picture and a description: a wide-eyed tortoiseshell calico, wiry, looking for a quick handout and a place to raise her many litters of young. Yes, for nearly two years this diminutive female was one major kitten-producing machine. 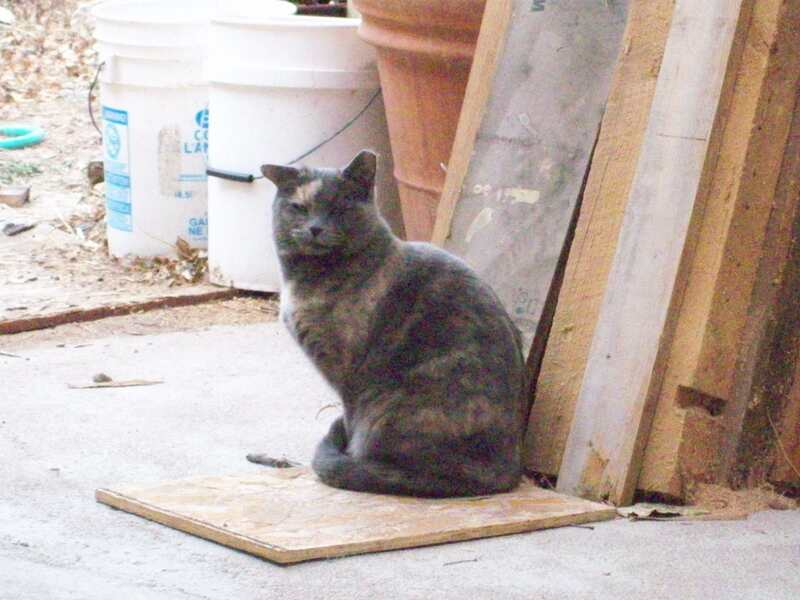 At first, we did not know how to deal with her—which, we actually thought a him, given the cat’s demeanor towards the other ferals: quite the ball buster who took no attitude from other felines or …dogs. Aptly named Sluggo, at first we didn’t realize that the saggy belly was NOT due to extra fur. We were so unschooled in handling pregnant cats, and we didn’t realize she was “with kittens” until the first litter: Pumpkin and Junior. Then the second…Tawny, Blackie, Minnie Me. Then the last…Chewie, Puffy, Bear and Corrina. Oyyy…we feared the cat population growing exponentially. And since we did not want to become the neighborhood cat maternity ward, Roger began to feverishly research ways to humanely trap her for spaying. Yes, you could rent or buy these specialized traps, but Roger just did not like that idea. Our first attempt was a failure: Roger constructed this large, cage-like area on the property. But the idea was too unwieldy and I was not available to help at the needed crucial moment to close the door—so she escaped and hurt her ear in the process. Now permanently bent, we both felt really bad over that fiasco. That slice-of-life experience was a great looking glass into how available I am and have tended to be over the course of my relationship with Roger. Sometimes the image reflected back is not very pretty. In my mind at the time, I was busily preparing to travel for paid performance gigs south of Denver, in Colorado Springs. Couldn’t this trapping wait another day or week? I had a week’s worth of early rising, and I had to be well rested for the drive and to perform optimally. But in my husband’s mind, this was the perfect opportunity to catch this kitten bearer. And she got away—and stayed away for nearly three months—due, in part, to my not being available. POSTSCRIPT: Roger finally did catch Sluggo—with another type of trap “box,” researched on the internet—and had her fixed late fall 2009. And partially out of guilt and to make amends, somewhat, I’ve continued to indulge my husband’s predilections for wanting the do the right thing… That is why I agreed to bring the partially feral Blackie inside the home after Minnie Me died..which created quite a bit of havoc with the cat hierarchy. But I put my foot down—literally and figuratively—when he started campaigning to bring Sluggo inside. Seriously?! A nearly 100% feral female into a home with one woosy poosy and four half brothers? Roger will just have to be satisfied with feeding his furry girlfriend out in the courtyard. Late fall 2009: Roger trapped and had Sluggo spayed. This incident begs the larger life question of balance. How do I truly know if I am making the right decisions in my life? And… how important is balance when it comes to living a creative life—a life not only replete with responsibility and obligation, but one that’s also painted with whimsy and magic? How do I balance my left-logical brain with my right-brained desires for expression and freedom? The Cosmic Catnip plastic jug—the reminder of the incident—now resides all clean and tidy on a high ledge of nick nacks that the indoor cats have yet to discover. The jug that almost did in Orange Kitty four years ago this week. 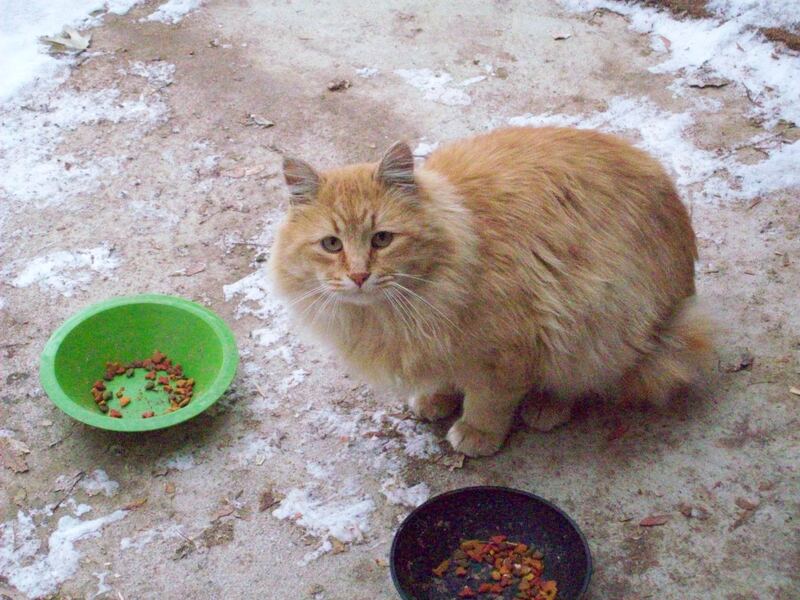 I asked Roger the other day, and he believes that Orange Kitty hesitantly meandered into our lives the winter of 2006. At that time, we only had one cat , Frisco, an elderly male Himalayan who ruled the roost. Then on one cold winter evening, Roger discovers this young, longhaired, male orange cat. It seemed that this feral orange tabby—which we immediately named Orange Kitty (I know, quite imaginative, ehhh? )—took advantage of the hole in our crawl space cover and had made the warm and moist area underneath our home his shelter from the elements. Having had no experience with feral c ats up until that point, we really did not grasp the emotional and life-changing ride we were about to take, kitty-wise, with the welcoming of this one skittish but seemingly harmless little cat who obviously needed shelter. Being saps for soft furry things that meow and purr, that winter we decided it would be fun to try to become friends with this outdoor cat. So Orange Kitty, with his questioning eyes, would come around for meals once or twice a day. Sometimes we would not see him for several days or even a week, but that was just his way; we didn’t make much of those times. We figured he would return eventually for his free meal. Fast forward to early July 2007: Orange Kitty had been away for over a week. It was very warm, way into the 90s, and it had not rained for a while. Roger and I were becoming concerned. When we did spot him, Orange Kitty’s head was stuck in a plastic jug! Oh, my…we tried our darndest to get close enough to pull it off, but the cat just ran away. This went on for nearly a week. Something in his little apricot-sized cat brain compelled the creature to return to us, yet he was too feral to let us get close. In our desperation, we even called Denver animal control. But even a trained animal control officer couldn’t cat him. We were both feeling quite exhausted over this lack of progress on the jughead fiasco. Then around day nine (!! ), success: Roger was able to corral Orange Kitty underneath the house—he was going to remove that jug, no matter the cost! With the ambient temperature in the mid 90s, Roger donned heavy jeans, a leather jacket and gloves in preparation to do battle with this wily, feral creature. After cornering Orange Kitty— who by that point was so weakened, he did not even put up a fight—Roger easily slipped the plastic jug off the cat’s head. I immediately set up a food (tuna!!) and hydration station for Orange Kitty, who voraciously took advantage of the relief and the food. It’s been four years, and Orange Kitty still meanders off for days and then comes around, running this scam with his questioning expression. And of course we feed him because we must. He is a bit more scrappy these days, getting into (loud!) fights over territory with other ferals. But at dinnertime there is a good chance we will see him lounging on the fence on the north side of our property—no matter how beat up he is—waiting for his hand out.